It's unfortunate Thedemon can't kit a thug for water breathing and try expanding in to the water for some extra sites/versatility (assuming he could keep such provinces without native pd). Expand toward Feinne who is currently holding off from attacking maybe? I don't do this because I DIDN'T THINK OF THIS FUUUUUCK. It would have been totally a great thing for me to do, too. I think it did occur to us recently in the game IRC channel that I could have done this. 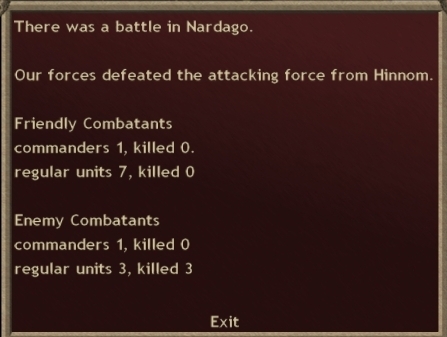 Hinnom fails at raiding me in Nardago, thanks to my defensive reinforcements. He loses 3 Dawn Guard. Sauro has withdrawn, and we see the reason for his fanatic defense and quick raid/withdraw. He's constructed a fortress across the bridge. 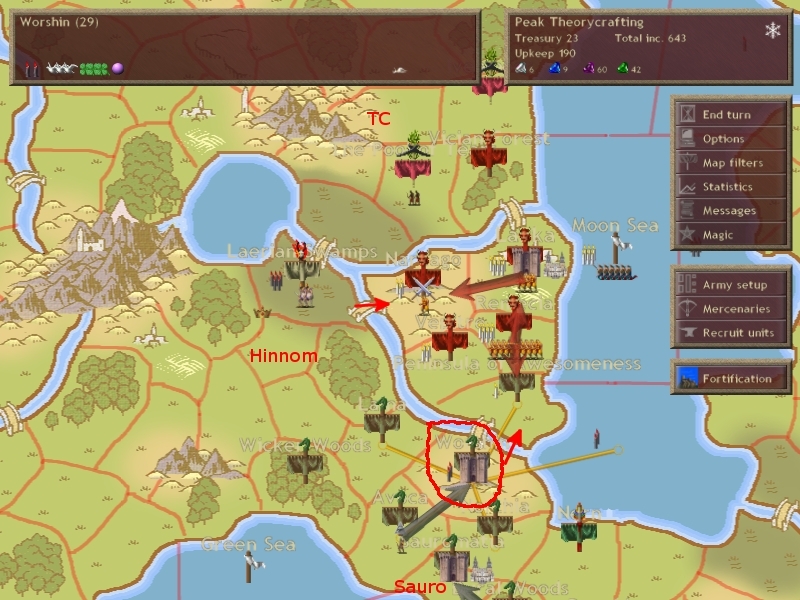 Had I won the battle for that province (the one where his pretender died) the fortress would have been destroyed. Attacking at what he probably thought was my main army also had a chance of preventing me from attacking onto him. In any event, I push onwards and reinforce my anti-hinnom defense.